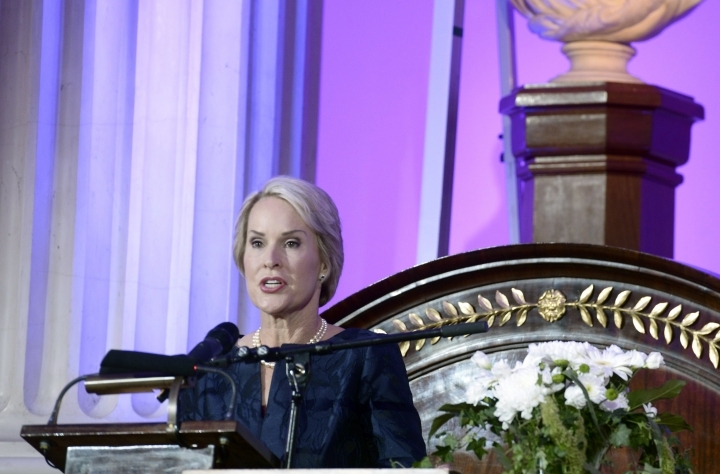 Arnold learned of her prize while traveling in Texas but flew back home Wednesday for a ceremony honoring her at the Pasadena, California, campus where she's worked for three decades. Arnold gave credit to her research team at Caltech. She called the institute a "jewel," where she was always "pushed to do her best and do things other people couldn't do." Arnold said she'll donate some of the prize money to worthwhile institutions, possibly including Caltech. "There are a lot of beautiful, elegant women in chemistry, and I predict we will see many more Nobel chemistry prizes for women," said Arnold, 62, who is only the fifth woman ever to win the Nobel chemistry prize. Arnold learned she'd won when was "unceremoniously woken up" at 4 a.m. Wednesday in her hotel room in Dallas. "I was certain it was one of my kids or some emergency, but it wasn't. First I was stunned, like somebody hit me over the head with something, and then I started to wake up." "I managed to pull a couple of neurons together, and now I'm processing it," she told The Associated Press. Arnold had planned to deliver a lecture Wednesday at the University of Texas Southwestern, but says she will now return to Pasadena, California, "to celebrate with my students" at the California Institute of Technology. He was "a bit rocky" early Wednesday after a feast the night before at Trinity College and was having coffee and aspirin when a caller from Sweden told him to expect a "very important announcement." Winter says the line went dead and he thought it was the bank "ringing up and telling me I had some dodgy transaction." There will be another party shortly in Cambridge. Lab colleagues told Winter that 2,793 pounds ($3,636) worth of Champagne have been ordered before asking "can we have your credit card please?" Dr. Wayne Marasco of the Dana-Farber Cancer Institute in Boston said the lab technique developed by the new Nobel laureates George Smith and Gregory Winter was "revolutionary ... and it's used today, every day." Speaking to reporters Wednesday, the 67-year-old Winter recalled a moment early in his career when he visited a woman who was receiving his then-experimental antibody treatment. Even though Winter didn't know whether the treatment would work, the patient was grateful for whatever more time it would allow her to spend with her husband, who was also sick. 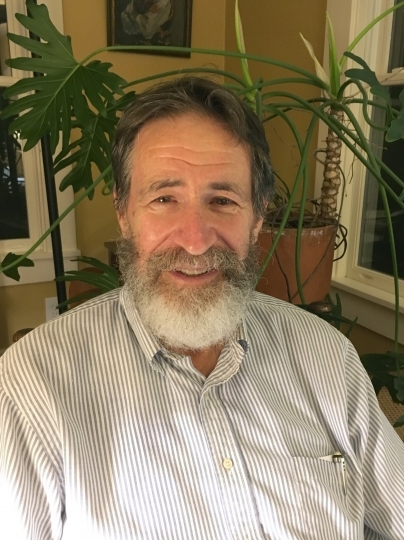 Winter, who shared the prize with two other scientists for his work on the directed evolution of antibodies, says he realized afterward there was a "moral imperative" to ensure "what was produced could be used for public benefit." The patient responded to the therapy but died when there wasn't enough to continue her treatment. The first winner was Marie Curie, who was honored in 1911 for the discovery of radium and polonium. Twenty-four years later, Curie's daughter, Irene Joliot-Curie, was recognized, alongside her husband Frederic Joliot, for the synthesis of radioactive elements. After a 45-year gap, Israel's Ada Yonath was one of three winners in 2009. 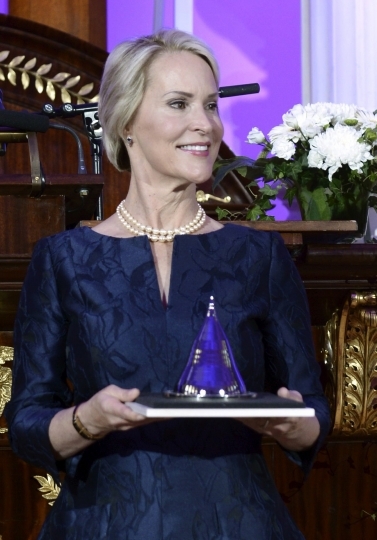 One chemical expert says the research of new Nobel laureate Frances Arnold "has really enabled lots of different chemists to think about how we can make proteins and design proteins to do some fascinating chemistry." Matt Hartings, an associate professor of chemistry at American University in Washington, D.C., says "her work is incredible." Hartings says the proteins that Arnold designed "do these really off-the-wall chemical things in record time." He says her directed evolution approach has greatly helped chemists make enzymes do jobs that nature never intended, such as for industrial purposes. Hartings said her recent development of an enzyme that can promote chemical reactions involving silicon was a startling accomplishment, "completely bonkers." Carol Robinson, president of Britain's Royal Society of Chemistry, says the prize shows how chemistry contributes "to many areas of our lives including pharmaceuticals, detergents, green catalysis and biofuels." 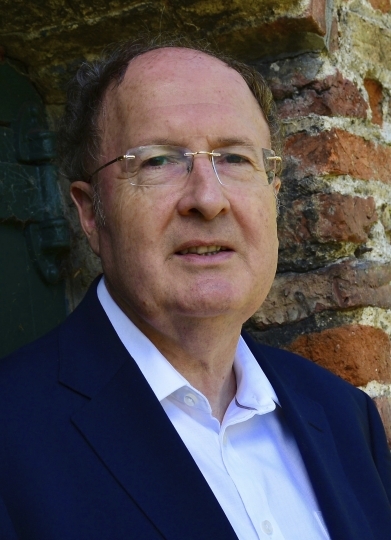 Robinson said Wednesday that directed evolution of enzymes and antibody technology "are now transforming medicine." Douglas Kell, a professor of bioanalytical science at the University of Manchester, says the prize is "fantastic news. Really well deserved. Nobels commonly go to folk who develop methods that revolutionize practice or understanding. These methods are entirely general and have done both." "Pretty much every Nobel laureate understands that what he's getting the prize for is built on many precedents, a great number of ideas and research that he is exploiting because he is at the right place at the right time," he told The Associated Press. "Very few research breakthroughs are novel. Virtually all of them build on what went on before. It's happenstance. That was certainly the case with my work. Mine was an idea in a line of research that built very naturally on the lines of research that went before." Smith said he learned of the prize in a pre-dawn phone call from Stockholm. "It's a standard joke that someone with a Swedish accent calls and says you won! But there was so much static on the line, I knew it wasn't any of my friends," he said. He said he has "no idea" what he'll do with the prize money. "We're going to give it away, I think. But we'll think hard how we'll do it. It's not just the money, it has a meaning well beyond the money." 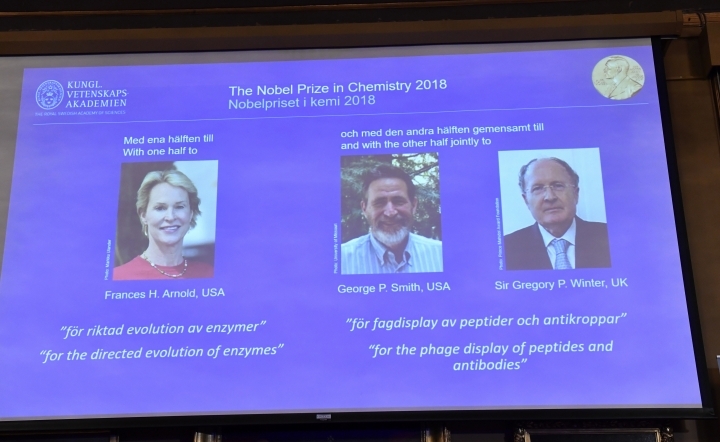 The Royal Swedish Academy of Sciences says the three researchers who were awarded this year's Nobel Prize in chemistry "harnessed the power of evolution" to develop enzymes and antibodies that have led to new pharmaceuticals and biofuels. The 9-million-kronor ($1.01 million) chemistry prize is the last of this year's scientific Nobel Prizes. Last year's prize went to researchers in the United States, Switzerland and Britain who developed a microscope technique that lets scientists see details of the molecules that drive life.